In this post, you’ll find some quick and easy spring maintenance tips for your home that will help keep your costs of home ownership down. By following these tips you’ll be able to enjoy your house all summer long without the fear of common problems popping up unexpectedly. When was the last time you inspected or replaced your furnace air filter? If you can’t remember, chances are that it’s been more than three months, and this is beyond the normal time frame that is recommended between changes. The filter is an essential part of protecting your furnace. It stops airborne particles from getting inside the unit and damaging it. However, once the filter gets too dirty, it becomes less effective at doing its job. If you’ve been running your furnace all winter long, the filter is probably saturated with dust. So, take a few minutes to replace your air filter at the start of every spring. That way it will be ready for the next winter season when you’re really going to need it. Once your furnace filter is maintained, the next order of business is to have your air conditioner cleaned and serviced in preparation for the hotter weather ahead. Not having your AC unit serviced is the leading cause of breakdowns and higher energy costs. You can do much of this maintenance yourself by replacing the filter, cleaning off the coils and straightening any bent fin combs. These small steps will help your AC unit run as efficiently as possible. Another thing to keep in mind is if you only have certain rooms in your home that you like to keep cool, a window air conditioner or portable AC unit could be a viable option for you. Window and portable air conditioners can save you a lot of money by reducing your energy usage this summer. Here are some additional benefits of using a window air conditioner, a short guide on how a portable AC unit saves money, as well as tips on finding the best window AC unit and portable AC unit for your home. As the warm spring air arrives and hot summer months just around the corner, you’ll most likely have your window closed while running your AC. This means that the same air will circulate through your home again and again, and this can be a very unhealthy situation. Therefore, it’s best if you clean it. An air purifier can help remove dust, allergens, mold, bacteria and other particles from your home’s air for a healthier environment. You can choose a small air purifier that’s good for one room or a larger model that can purify the air inside your entire house. Choosing an air purifier with permanent HEPA filter will save you the most money in the long run. A cheap ionic air purifier is the second cheapest option. If you have animals in the home then getting a top air purifier for pets and allergies is the better choice. Or you can always browse through our list of the 10 best home air purifiers to what all is available. The spring is the best time to change your smoke detector’s batteries and ensure that they’re working properly. Each year, three out of five deaths from household fires could have been prevented with a working smoke detector, so it’s important to have a few. You should have one smoke detector per each level of your home. The ideal locations are near the bedrooms, in a hallway and close to the furnace. If you don’t have multiple smoke detectors in your home or they’re not placed it locations such as those mentioned, now is the time to make these types of adjustments. You do have a fire extinguisher in your house, right? If not, you should go out and immediately buy on to have on hand. Fire extinguishers should be checked at least once yearly, including the hose, nozzle, and other parts to make sure they are in good condition. Also, make sure that the pressure gauge is in the “green” range. If necessary, move your fire extinguisher to a more accessible room of the home so that you can grab it quickly in case of an emergency. Over time, lint builds up in the dryer itself and in the dryer vent. And every year, there are over 2,900 household fires caused by dryers and 34% of those fires come from not cleaning out the lint. Don’t let your home become part of this statistic. Get a damp rag and clean out the lint screen. A special dryer vent cleaning kit can be bought online or at your local hardware store. A dryer vent cleaning kit includes a round brush and an extension handle (wire) for cleaning out the full length of the tubing that leads from the dryer to the wall. This pipe is a hot spot for collecting lint and causing dryers to overheat. You’ll also want to clean out the dryer vent opening that leads to the outdoors. This is another area that gets clogged easily with lint. A recent study discovered that showerheads harbor microbes that can cause you to get sick. To help these organisms from spreading in your home, it’s best to unscrew all of your faucet and shower heads every spring and clean them out. A simple trick is to soak them in equal parts vinegar and water for an hour, and then rinse them out before you put them back together. The vinegar will help dissolve any bacteria or slime layers that may have built up over the past year and keep your water faucets healthy to be around. Did you know that incandescent light bulbs waste 90% of their energy producing heat? That’s a lot of money lost over time by using them in your house. Newer energy-efficient CFL and LED light bulbs can save you money and reduce your energy costs all year round. A 60W incandescent bulb costs about $4.80 per year to use and lasts 1,000 hours. A 15W CFL (equivalent) bulb costs about $3.50 per year to use and lasts 1,000 to 3,000 hours. A 12W LED (equivalent) bulb costs about $1.00 per year to use and lasts 25,000 hours. Your home likely has 20 or more light bulbs in it. By switching your bulbs out to a CFLs or LEDs you can easily save between $30 to $100 each year. Check every electrical cord and outlet throughout your home for fire hazards. Generally, you’re looking for bare wires, frayed cords, loose electrical outlets, or broken cords. Take time to check your home’s fuse box and any extension cords as well. If you notice bare wires or bad cords, replace them. 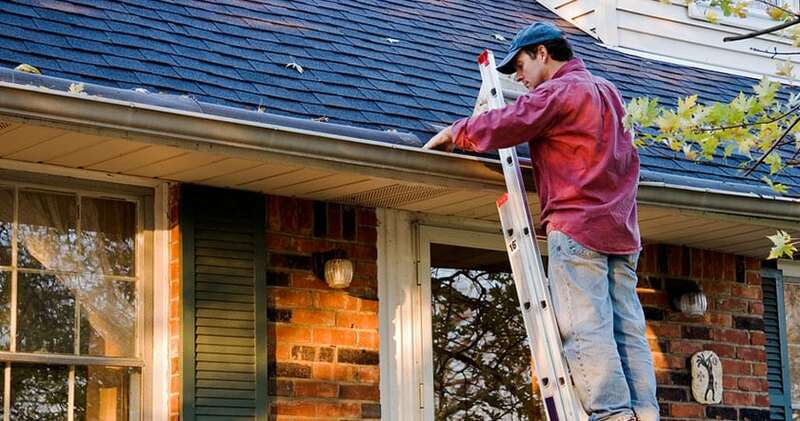 The autumn, winter, and spring months are plenty of time for dead leaves, sticks, and debris to clog up your gutters. Cleaning your gutters in the spring reduces the chance of damage too the gutter itself and water damage to your home. If your home has a crawlspace, it has foundation vents that lead to the outside. You want to clean these out each spring and remove any debris from the screens. It’s also a good time to check for damaged vents and replace them as necessary. These vents are essential for preventing mold and moisture build up as well as keeping your foundation solid. Don’t forget your yard when you’re getting your house ready for spring. There are several little things you can do in a short weekend. Go around and clean up and leaves, sticks, and debris. Check any surrounding trees for signs of damage or rot and get rid of them. Also, it’s a good time to check your sidewalks, patio, and foundation for cracks or chips and repair them. This list of home maintenance tips for spring can help you get the inside and outside of your home ready before the summer hits. By following these guidelines, you’ll be able to keep your property in good shape as well as ensure a cleaner, healthier living environment.